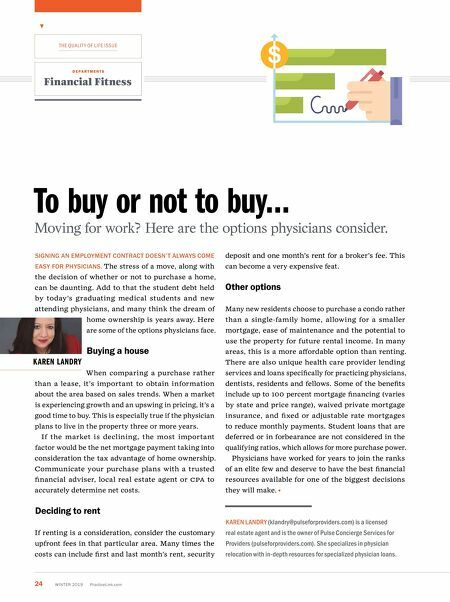 24 W INTER 2019 PracticeLink.com ▼ T HE Qu AL I T y O f L I f E ISS u E D E P A R T M E N T S Financial Fitness K a R e N la NDR y t o buy or not to buy… Moving for work? Here are the options physicians consider. S i GN i NG a N e MP loy M e N t C o N t R a C t D oe SN' t al W ay S C o M e ea S y fo R PH y S i C ia NS. The stress of a move, along with the decision of whether or not to purchase a home, can be daunting. Add to that the student debt held by today's graduating medical students and new attending physicians, and many think the dream of home ownership is years away. Here are some of the options physicians face. Buying a house When comparing a purchase rather than a lease, it's important to obtain information about the area based on sales trends. When a market is experiencing growth and an upswing in pricing, it's a good time to buy. This is especially true if the physician plans to live in the property three or more years. If the market is declining, the most important factor would be the net mortgage payment taking into consideration the tax advantage of home ownership. Communicate your purchase plans with a trusted financial adviser, local real estate agent or CPA to accurately determine net costs. Deciding to rent If renting is a consideration, consider the customary upfront fees in that particular area. Many times the costs can include first and last month's rent, security deposit and one month's rent for a broker's fee. This can become a very expensive feat. Other options Many new residents choose to purchase a condo rather than a single-family home, allowing for a smaller mortgage, ease of maintenance and the potential to use the property for future rental income. In many areas, this is a more affordable option than renting. 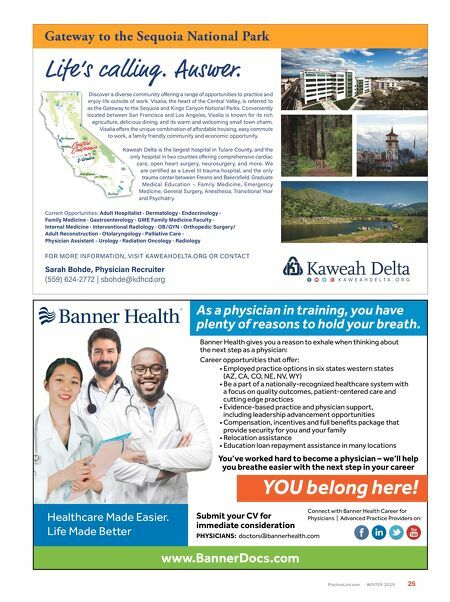 There are also unique health care provider lending services and loans specifically for practicing physicians, dentists, residents and fellows. Some of the benefits include up to 100 percent mortgage financing (varies by state and price range), waived private mortgage insurance, and fixed or adjustable rate mortgages to reduce monthly payments. Student loans that are deferred or in forbearance are not considered in the qualifying ratios, which allows for more purchase power. Physicians have worked for years to join the ranks of an elite few and deserve to have the best financial resources available for one of the biggest decisions they will make. K AREN LANDRY (klandry@pulseforproviders.com) is a licensed real estate agent and is the owner of Pulse Concierge Ser vices for Providers (pulseforproviders.com). She specializes in physician relocation with in-depth resources for specialized physician loans.